I had originally intended that the next update to this blog would be a few statistics pertaining to the season just gone. However, when you spend most of your day working with spreadsheets, the last thing you want to do when you get home is bury your head in even more numbers whilst negotiating the exciting world of multi-sheet functions. As a consequence the work that needs to be done keeps getting put off in favour of more exciting things such as the new Indiana Jones film or jet washing the wheelie bin. The reason as to why this isn't that list of numbers detailing goal times, etc. is because I promised something to a couple of people at last night's Mossley AFC quiz night after a few of the early questions had a Sylvester Stallone theme. That something in question is a clip from the Turkish remake of Rambo. Yes, you did just read 'clips from the Turkish remake of Rambo'. Oh, and by the way, the new Indiana Jones film isn't that bad - in fact it's better than you probably would have expected. The 'mcguffin' isn't a particularly strong one and the ending is a bit of a let-down, but the balance between humour, sentiment and action (the equation which has let down many of the wannabe films such as The Mummy and National Treasure) is perfectly weighted. It goes without saying that there are leaps in logic that you shouldn't spend too much time thinking about, but an early scene that includes the caretaker from Scrubs and Jim Robinson from Neighbours does briefly make you think you're watching an Indiana Jones film from an alternative dimension. After starting the 07/08 season watching Stalybridge Celtic versus Manchester City reserves way back in July, it seemed a fitting piece of symmetry, after 40+ Lilywhite matches, to end it by watching the Bower Fold club. The late decision to travel to Celtic's Conference North Play-off Final against Barrow was rewarded by the lack of traffic on the motorways; a rare instance that resulted in a leisurely 90 minute drive to Burton's Pirelli Stadium. As new grounds go Burton Albion's might not be the biggest or the best in the country but, pitch apart, it's a great place to watch football. Even though it is almost twice as expensive at £7m, it shows up the Tameside Stadium to be the missed opportunity that it is. The ease in finding a parking space half an hour before kick-off suggested that the game wasn't to be the sell out some had hoped for and so it proved to be. Of course the decision for a 7:30pm kick-off on a Friday night in South Derbyshire didn't go anyway towards helping to boost the gate but there certainly looked a tad more than the official total of 2,500. While not being anywhere near as well supported as Barrow, the lack of numbers from Stalybridge was also quite surprising. As for the game itself it wasn't a classic. Aided and abetted by some terribly wayward defending and some notable no shows in terms of performance from their opponents, Barrow did the bare minimum necessary to win the game but they did it well. It was only in the last 20 minutes of the match when a goal down that Stalybridge decided to make a proper fist of the game - hitting the post and having a nailed on penalty turned down by the referee but it was too little too late. In fact this probably made things worse for the Stalybridge fans in attendance as it showed them what might have been had the team expanded their twenty minute cameo to cover the course of the ninety. The weirdest thing is though that despite being stood in Stalybridge end, knee deep in black and orange balloons, I remained entirely nonplussed with the events unfolding around me. Usually my neutrality at games not involving Mossley eventually gives way to me preferring one side over the other but for the second time in a week this wasn't the case. I've been trying to think of the reason as to why I remained completely ambivalent to the events unfolding around but any conclusion so far remains elusive. On the one hand, if Mossley can't have any success then I don't want a club in a neighbouring town to have any either. It's selfish I know but it's football - why labour under the pretence that local rivalry is a charade and we all want each other to go on to bigger and better things? On the other though I didn't really want Barrow to win either, purely as payback for foisting Neil Briscoe and other reserve team no-hopers on us last season. Well that and self-preservation: the last thing you should do when surrounded by a few hundred football supporters from one club is cheer on the side they're playing. Despite having just won promotion to the Conference, more than a few Barrow fans decided a more pressing concern than celebrating with their team was to get as close to the opposing fans as possible and goad them (and with a fair number of Celtic fans attempting to get on the pitch to "discuss" it with them), it seemed a good a time as any to say farewell to live football for the season and start the countdown for the arrival of the first friendly. The continuing need to see live non-league football, even though the Unibond season has finished, meant that there were more than a few Mossley supporters amongst the 1700+ present at Bower Fold on Sunday to watch Stalybridge take on Southport in the second leg of their Conference North Play-Off Semi Final. So, anyone for Burton on Friday? The season may be done and dusted for Mossley but non-league football continues unabated in various pockets of Tameside and the surrounding area. So many games in fact, that it was possible to watch a match everyday between the Monday after the Wakefield game and the following Sunday. At least that was the case if you completely ignore the fact there was none on Thursday and Friday. All of which meant good news for those Mossley supporters desperate to extend their fix of non-professional football for at least another week. 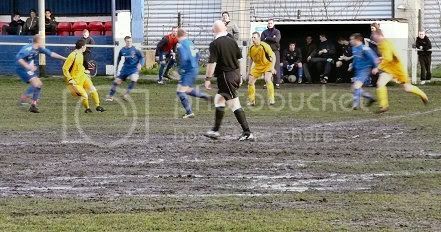 The week began at Glossop North End’s rearranged game with Trafford and what game it was. With nothing to play for and a pitch resembling something you’d expect to see Sébastien Loeb struggling to steer his rally car through rather than anything you'd play football on. Given both the conditions and that there was nothing for either team to play for (Trafford having already been crowned champions of the NWCL), you'd have forgiven either side if they approached the game at anything less than a 100%. It's to their great credit though that they didn't and in a surface mocking ninety minutes, they produced one of the best matches I've seen this season: no long ball, no quarter given attacking football. Trafford eventually won the game 2 – 1, a result which was incredibly unfair on Glossop as the least they deserved was a draw. I just wish that the following footage did better service to showing just how good a game it was. Passing up the opportunity on Tuesday to journey to Skelmersdale and see Curzon's season finally implode ("Hey Mickey you're so fine, you're so fine you got sent off after 20 minutes for head butting an opponent, thereby ruining the chances of your team being rewarded for their seasons endeavours with promotion to the Unibond Premier League, Hey Mickey clap-clap clap Hey Mickey clap-clap clap"), the next game to be taken in by the Mossley nomads was the NWCL League Cup Final at the Tameside Stadium on Wednesday. Five years ago in the same competition we watched Mossley lift the cup after beating Clitheroe in a game that could best be described by simply saying that it happened, such was the paucity of entertainment contained therein. Thankfully though the 2008 version involving Bootle and Maine Road was slightly more entertaining. Although it very nearly didn't happen, at least not on that night. When I got to the ground 55 minutes before kick-off the place was shut. Only the faint sound of Silver Lady by David Soul being played over the tannoy giving any indication that there was somebody in. It was only when the Bootle team arrived and a figure finally emerged from the bowels of the stadium that I, along with the smattering of people who'd turned up after me, eventually found out what was happening: the referee had only just given the game the go ahead. An early evening downpour had put the game in some doubt and when we were finally allowed into the ground it was easy to see why - the pitch was horrendous. By kick-off though the drainage had performed something of a miracle and the pitch was in a near playable half grass/ half ankle deep mud state. Maine Road took an early lead and one which, to be honest, never looked like being pegged back as Bootle offered nothing in the way of a threat. That was until the stroke of half-time when the Liverpool side surprised everyone, not least their own supporters, by scoring from a corner. 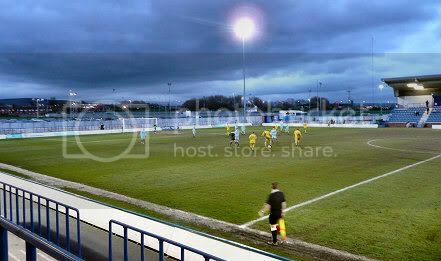 The second half began with Maine Road regaining the advantage before a double substitution by Bootle turned the game on its head and they got a deserved equaliser with fifteen minutes left. Despite the best efforts of both sides, the game went into extra-time and eventually penalties before Maine Road were determined as the winners; condemning Bootle to their second cup final defeat in the space of a week after losing to Kirkham & Wesham in the Division Two Cup. While there were only 201 people present (a fair few of them being neutrals too including a Ramsbottom fan who recognised us from our visits to Riverside Ground years ago and ex-Lilywhite Joe Shaw) the game was played in a friendly atmosphere, free from any animosity. Although it would have been nice if the the father of one of the Bootle officials had stopped moaning at a very good referee for the odd minute or two. So that's been two good games in the space of a week and now it's up to Stalybridge in the second leg of their Play-Off semi-final on Sunday to make it a hat-trick.